Last weekend was the Hungarian DX contest and I decided a few days prior that I was going to enter it. I planned on a single band entry which would allow me to spend a few hours on the Saturday afternoon and then come back again on Sunday morning when the band re-opened. I worked from 12:00 to about 17:30 on Saturday making just under 200 QSOs at an average rate of around 35/hour which I was satisfied with. I’m far from being a ‘big gun’ station and so I’d not really expect much more. I was spotted on the DXCluster a couple of times and that helped my run rate. A couple of times towards the end of the day I noticed my Acom 1000 amplifier cut out with an ‘ARC FAULT’ on the display. I checked the manual and it just says ‘ARCF, logic’ which doesn’t really mean much to me but I checked my drive levels and reduced the processor gain a fraction. I know from reading a mailing list that the TS-590 has been occasionally prone to ALC spikes and I didn’t want to be overdriving the amplifier. I only run 25 watts input power for a measured 400 watts output so I know the amp should just have been ticking over. On Sunday morning I was up bright and ready for a few more hours operating but that was cut short very quickly. I’d made just ten more QSOs and the ARC FAULT kept reappearing and then the amplifier cut out with an error message I didn’t make a note of but which indicated a fault with the aerial. I immediately aborted my CQ calls and checked the aerial. This is what I found. The reading was the same on all five bands that the aerial covers, 20m, 17m, 15m, 12m and 10m so I knew straight away that the problem wasn’t with any of the traps as if a single trap had failed then not all bands would have demonstrated the high SWR. I suspected the balun, or matching network as Cushcraft call it to be causing the fault but as I had plans for Sunday afternoon I couldn’t easily do anything to check until today. Yan, M0YNK and myself lowered the mast and checked inside the matching network – Everything looked absolutely fine which was a shame. I’d hoped to see an obvious point of failure but no, it seemed to be OK.
We removed the network and started testing continuity between the input and output and at the end of each of the tails which go to the elements. The matching network is nothing more than a 1:1 choke balun so there’s not too much inside to fail. The torroids were all in one piece, none of the joints seemed to have come unsoldered and there was no signs of anything melting. I should hope not! The aerial is rated at 1.2kw and I’ve not run more than 400 watts into it. 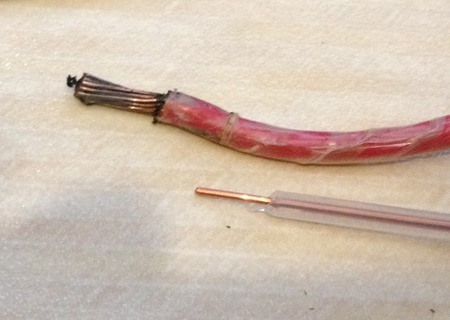 We finally tracked the fault down to the coax tail which feeds from the output of the balun to the 12m/17m element. Although the MA5B looks like a three element beam, it’s actually not. It’s two elements on 10m, 15m and 20m and a single element rotary dipole on 12m/17m. The tail produced some strange resistance readings between the centre and braid depending on which end I measured from! The end is completely rubber enclosed so it wasn’t possible to take it apart cleanly so after a lot of snipping, cutting and tugging I was left with lots of pieces of rubber which smelt badly burnt and a red feed wire with black burn markings on the end which also smelt terrible. 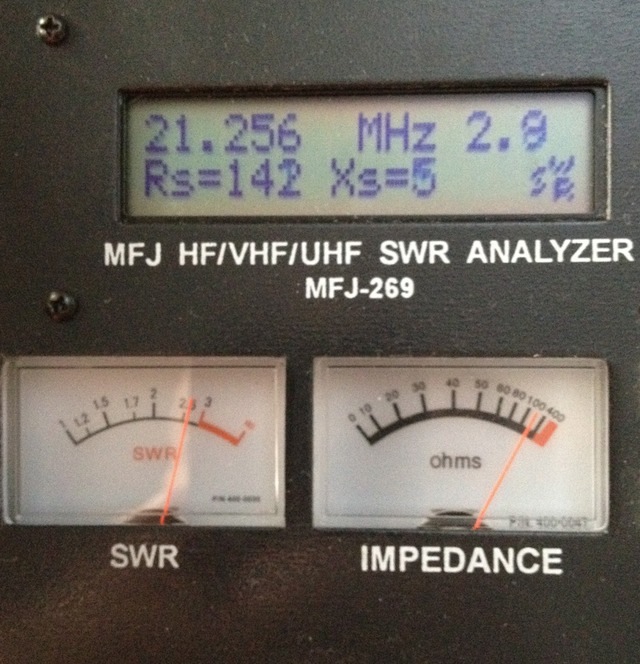 I’ve read quite a lot of reports from stations in the USA complaining that traps have melted on their MA5B when running high power but I never expected this to happen when running 400 watts. In fact there are reports of traps failing when operated at the UK maximum power as well so I suppose the matching network and the traps are a weak point and having seen what my power has done, I’m glad we don’t have a higher power limit. To resolve this fault we simply removed the tail for the 12m/17m element and left the aerial working on 10m, 15m and 20m. I’ve decided that I’m going to replace the entire matching network and coax tails as I can’t risk this happening again. It’s a good job my Acom 1000 has such good protection as I’m sure some other amplifiers wouldn’t have survived having a high SWR suddenly appearing on the output. I was keen to get the aerial into a usable state today as there are a couple of DXPeditions that I’m keen to work and I’m pleased to report that this afternoon I’ve worked HK0NA on Malpelo Island on 10m, 15m and 20m. This entry was posted in Amateur radio, Broken aerial, Contesting, HF, New DXCC, SSB and tagged cushcraft ma5b. Bookmark the permalink.